Let’s talk panniers for a minute, shall we? In my opinion, there are a few basic essentials that you need if you’re going to use a bike as your main transportation. You need a helmet. You need lights. Even if you like wearing a messenger bag or backpack, a rear rack adds a lot of options for cargo. You may not think you need fenders, but that just means you’ve never been caught away from home when it started raining. And for the bigger jobs, you’re going to want a pair of pannier bags. I’m consistently impressed with my Axiom waterproof Stormfronts. I received a pair of these bags as a gift about this time last year, and while I’ve only needed to use them a handful of times, I’ve been thankful for them every time I have. With these bags, I can pick up enough dog food to last us months. I can pick up a decent load of groceries. And tomorrow, I’m going to use them to donate some clothes. In that picture above, one bag has a Carhartt jacket and a big puffy vest. The other has a half dozen button-up shirts and three polo shirts. Mind you, I’m a big guy - these are all fat-guy-sized clothes, and had been filling a big Rubbermaid tote in my closet. I was trying to figure out if I’d be able to bungee a box or something to my rack to get it all to the Salvation Army, but these panniers could handle even a little more if I needed them to. Furthermore, they’re built tough, they’re waterproof, they’ve got reflective panels, and they even came with extra mounting hardware in case they wear out. 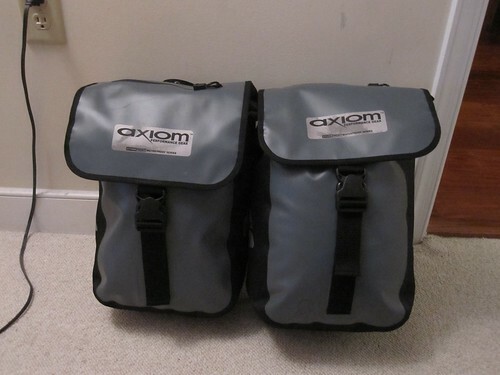 Unfortunately, it looks like this model has been discontinued, but Axiom has several other panniers available. Get yourself a large-ish set and keep them handy to make sure you never have an excuse not to ride your bike!